Here's a shot from the main living room to the dining room. You can just see the doorway to Chris's room in the baackground and the centerpiece on the dining room table--two claw-shaped candle holders:) I wanted to do a few more, but none of them looked good--the dining room is a real mess right now, Kelly moved a lot of his stuff in and it's still in boxes. Right, John, Joe and--uh--Sam someone or another leaning against the kitchen bar. A few shots of the living room follow. No, they don't make a lot of sense--Chris did most of the design. As of now the sword rack is a bit more full. 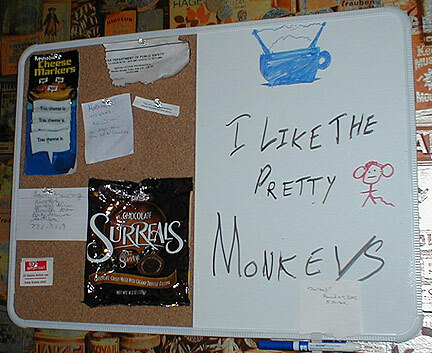 This is a close-up of the bulliten board behind the tea bar. Note the package of reusable cheese markers. The fortune cookie message reads "you will get something special because of your charm." I don't know why Chris found this meaningful, but there you go :) The torn up scrap of paper at the top is actually burned at the edges--it's a note on home safety that got burned during a candle accident. Most of the message boards in the house are competitions for weirdest entry. Bookshelf in the living room--mostly game books. Joe talking to the wicked witch of the west after stealing her hat, and Count Jalepeno presiding over the table near the tea room. 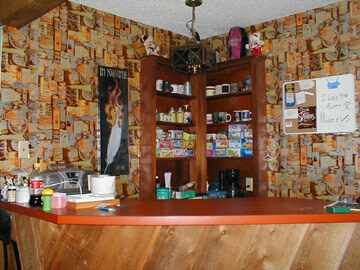 Since then, Chris has seriously decorated his room. This is around day 2. One of the walls in our bedroom, and a view from the window.